Motorcycle Engine Care Treatment from Mega Power has my 1984 Maxim purring even when this old. Motorcycle Valve Tune Up Additive from Mega Power Stops tapping and backfire. Motorcycle Engine Care The Mega Power Way. Solving Tapping, Rough Idle, and Backfire Problems. Valve tapping, rough idle, lo-speed stalling, and backfire occurs when one or more of your dirty engine valves are still closing as combustion occurs. The low speed circuit in carburetors are plug up. Engine valve cleaning and carburetor cleaning is required. Cost for a mechanic to do both repairs run $1000 to $2000. The fix is to remove carbon on piston tops, valved ans associated parts and takes a week. Carburetors are sent out for boil-out of plugged passageways so low speed fuel delivery flows through them again as designed. Tapping: As valves become dirty and sticky operating, they lose their snappy closing speed. A space between the cam and valve appears as the cam contact speeds away from the valve stem. As the cam swings around to push the valves open the space closes with a hammer-like smack - the tap. Low speed stalling: If the choke is blocking air flow, and the bike runs OK, the low speed circuit is plugged up. Rebuild the carburetors. If no change, sticky valves cause the problem. Have the valves cleaned. See item 1- above. Using additives to remedy tap, stalling, backfire problems. Shown above are additives to needed. 6 required. A 2 step procedure is performed. Directions are easy to follow. Nothing to take apart. During the 2 steps, a chemical cleaning and conditioning action occurs in the carburetor, and piston valve area of the motor. Takes a week or more for the products to work. On my Honda Shadow, it took a month. Occasional does of the additives seems to keep the trouble away. Motorcycle Engine Care to avoid repair. Most times, you perform the chemical cleaning with the Mega Power Service Kit to see if that avoids engine cleaning expense. It usually is that fix. So that can avoid a $1000 repair expense. Carburetor cleaning is a 50/50 success. Carburetors, if not cleaned by the treatment then they just need cleaning. After cleaning and repair, addition of the fuel and engine additives keep things clean and trouble free. One ozs of the fuel additive with each fill up of fuel keeps the passageways from plugging up. Additive addition at future oil changes keep engine clean and trouble free. That's the motorcycle engine care and fuel care found best of all for long term care and protection. Engine valve overhaul is a costly $2000 fix a shop can do for you. 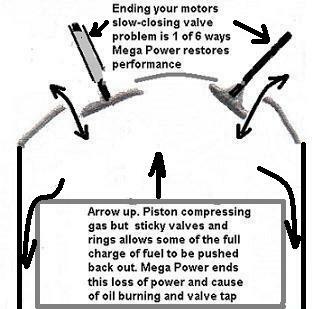 Mega Power's $100 method using their engine valve treatment is another motorcycle engine care way to solve this problem. Order Mega Power here...Its what every bike needs. Mega Power 's Valve Treatment includes 6 items needed, easy to follow directions, phone help, and guarantee. Shipped to your door in about 3 days. Just $80 plus $15 s&h= $95 total. Let me illustrate: How your motorcycle engine care for valve tapping, and my chemical remedy from Mega Power, ends tap and cough - with out taking your motorcycle apart. Hole a pen or pencil in a lose fist grip, so it will fall thru the grip. Catch and hold it with a free finger. Use the finger to raise and lower it one inch. that is what your motor cam lobe does in the same way to open the valves. Only thing is this. An 80 pound valve spring is what closes the valve. The cam lobe just opens it to let fuel in and exhaust out. But oil breakdown residue - tar, vanish resist, and slows the normally snappy valve closing action. Now, we've got problems, Houston! Cam action and space closing. With a space from slow closing, the cam now spins down, around and going upward again smacks the bottom of the valve stem as it rotates every second or two. That smack you hear as a metallic tap tap tap. And you thought your expensive oil was working for you. Yep! It way to much for any any to contend with. If you give that pen or pencil just the slightest squeezing the pen or pencil will fall - but slowly. Instead of dropping quickly. That is your problem. And here is another negative Mega Power's Motorcycle Engine Care Treatment ends. If that hot valve stem keeps oil out, friction will occur. The stems shinny smooth surface will become rough - for lack of oil, and look like sandpaper. And that could happen on the stems too - to cause resistance, and the tap tap tap. And carbon can hold valve open to cause the tap also. Those are serious wear problems Mega Power ends to provides clean smooth conditions that make for a great bike ride again possible! Install these carbon removers to end valve tap, rough idle, backfire. As you can see, the "gray" and "black" area on the valve stems cause the problem. This area of your motorcycle runs about 1,800 degrees - as fuel burns. Combustion expands to push your piston down, spin the gears and speed you down the road. Normally, the valves let fuel in, and exhaust out, although running hot run trouble-free. Your valves bathe in the heat of combustion constantly. The valve head - the upside down "T" part runs from 500 degrees to over 1000 degrees. If you remember cooking 101, you know your frying pan smokes oil at 400 degrees. And its the same with your bike motor oil. It needs to stay under 300 degrees - yet, valves run much hotter, but are the first to cause trouble, getting dirty first. Mega Power uses that heat to undo your bikes dirty problem chemically! As oil lubes, it can't overcome the varnish and friction problem. Mega Power's motorcycle engine care ingredients cool your valve stems by friction reducing the heat load, and reverts varnish back into good oil ending tap and backfire. That's good, of course! Our Mega Power Motorcycle Engine Care Treatment is what you need to end Valve Tapping, and Backfire Problems. Tar is sticky and slows down valve-closing, creating a space that adjoining parts close with a tap. It takes about $1000/$2000 for the mechanic to clean and free everything. Our method is under $100! Ordering Mega Power to end your motorcycle valve tapping. If tar or carbon slow the valve enough, it will still be open during combustion. A backfire will result. Friction is also a cause of the problem. Both residue and friction problems are corrected with Mega Power addition to the fuel and oil. There you are. You know more than most bikes mechanics on this problem and its causes. Mega Power will clean and free those sticky valves of their tar-like conditions and float the tar away for filtering. Then keep them away. The result is 4 to 12 valves in your motor operating like when new and quiet. The power and zip response is amazing! You want those factors, don't you? Mega Power includes 6 items needed, easy to follow directions, phone help, and guarantee. Shipped to your door in about 3 days. Just $80 plus $15 s&h= $95 total. Could be the only known remedy to end motorcycle valve tapping - beside a costly repair. Some motorcycles have Hydraulic lifters that can also cause the tap from blowby cooks your oil into a gravy-like sludge. People talk "adjust valves" - but it is seldom needed, if ever, as valve material is so hard it hardly wears any in a lifetime -unless lack of oil, overheating occurs, or poor oil change habits happened to cause unusual wear out. Then, your whole engine will be shot, too! That is not likely - is it? The Mega Power Valve Treatment - shown below, contains the only chemistry know to quiet valve tap the right way. Mega Power research found the six products needed to end motorcycle valve tapping. It is best describe as a "treatment" where two steps are followed to end the motorcycle valve tapping. You may want to try this product to end your motorcycle valve tapping problem. It can be ordered on line, and is made for anyone to easily install themselves. Danger. Some additives sold for valves are solvent cleaners - since we are talking tar and residue removal, it would seem that would be good. Not so! Today;s motors - cars and bikes, are machined with close tolerances and solvents, in cleaning, clean well, but can remove the oil film also - from between your bikes pistons, bearings, valves, and gears in the cleaning process. You may have heard horror stories about part store additives causing motor destruction. Now you know why. It most likely was caused buy a solvent based additive, or maybe one of those honey-like oil thickeners sold as a motor additive. Stay away from those type products! Mega Power uses chemicals to clean and remove the tar - freeing the valve of its tap hang up problem. By using the fuel, air intake, and oiling system every ring and valve is cleaned, then smoothed with anti-wear - called MC+. The Mega Power MC+ anti wear ingredients go on to fill any worn spaces and add a protective coating. This allows more power to develop from combustion, and again allows that power to speed you down the road - faster, customers report. That chemical type of cleaning and anti-wear treatment prevents future sticking and friction caused problems - also, customer tell us. I agree! 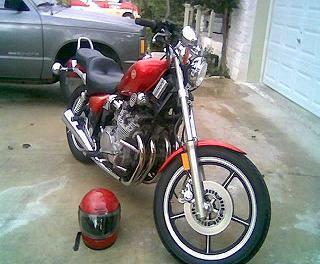 that is my experience with my Yamaha Maxim and Honda Shadow motorcycles. Both of which had motorcycle valve tapping problems when I bought them. Now, years later, they start right up and sound as if quiet and new! Mega Power works to clean your motorcycle valves to re-power your motor - sometimes in a few miles to a week of driving does. Most bike owners rave over the quiet smoothness that returns - ending and taking away a serious cause of concern. Yep! I use the same Mega Power Valve Treatment product to end ten-thousand car valve tapping problems. And to end my motorcycle engine tap and sluggish power problems, too!